Police are seeking clues after what was described as an improvised explosive device fashioned from a propane canister was ignited on a driveway in Pasadena on Sunday morning, but apparently failed to detonate, authorities said. The incident was first reported just before 4 a.m. in a residential driveway in the 1800 block of North Madison Avenue, Pasadena police Lt. Pete Hettema said. “Residents awoke to a flame coming from the driveway in front of the house and a hissing sound,” the lieutenant said. Firefighters quickly responded and extinguished the flames. “The flame was coming from a small canister similar to a propene tank,” he said. Though the device had been burned and melted, investigators initially suspected the canister had been placed on top of a tray or pan, which was then filled with flammable liquid and set ablaze. There were no indications as to a motive, and no information about any possible suspects. The investigation was ongoing. Sunday morning’s fire was not the first unexplained potential arson attack in Pasadena in recent months. An unidentified man tossed what police described as a homemade pyrotechnic device into a crowded Cheesecake Factory restaurant on Colorado Boulevard on Feb. 2. It resulted in no injuries and no serious damage, officials said. After exhausting investigative leads, the FBI released video surveillance camera footage depicting a possible suspect and offered a $20,000 reward for information leading to the capture and conviction of the attacker, Deidre Fike, assistant director of the FBI’s Los Angeles field office, said at the time. The case remains unsolved. DUARTE >> A woman is accused of arson after she allegedly torched her family’s home in Duarte during an argument, authorities said. The fire broke out about 3 p.m. at a house in the 3000 block of Freeborn Street, Los Angeles County sheriff’s Lt. Ronald Daily said. Deputies were first summoned to the home for a family disturbance among adult family members, the lieutenant said. “One of the family members had deliberately lit a fire,” he said. The others inside the home escaped without injury, but the flames engulfed the home, resulting in “substantial” damage, according to Daily. Deputies found and arrested the alleged arsonist at the scene, he said. The woman’s identity was not available as she was taken to a hospital prior to booking after complaining of a pre-existing medical issue, he said. Detectives from the sheriff’s Arson-Explosives Detail were summoned to take over the investigation. LA VERNE >> Police arrested a man Friday on suspicion of igniting a brush fire that scorched about 50 acres in La Verne and nearby unincorporated hillsides, officials said. Christian Joseph Romano, 18, of La Verne was booked on suspicion of arson following his arrest about 4:20 p.m., according to La Verne police officials and Los Angeles County booking records. He’s accused of igniting the Rodeo fire, which broke out shortly before 3 p.m. Sunday in the area of Briley Point Road and Williams Avenue, La Verne police Lt. Thomas Frayeh said. No injuries or property damage were reported in the fire, which burned through about 50 acres of brush before it was contained by firefighters the following day. 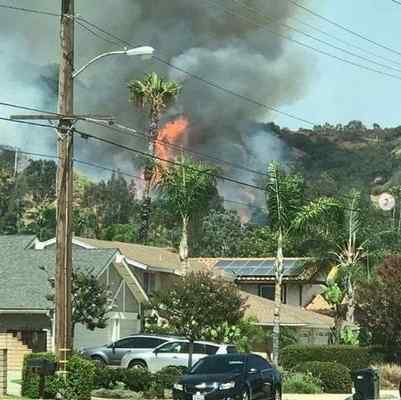 Several neighborhoods were placed under voluntary evacuation orders as the flames crept close to homes, including those on Rodeo Lane. As the investigation continued in the following days, investigators determined that the fire was an arson and identified Romano as the suspect, Frayeh said. Romano was released from jail after posting $20,000 bail pending his initial court appearance, records show. PASADENA >> Police are seeking man and woman who tossed a firework into brush in front of the Villa Parke Community Center in Pasadena on Independence Day, scorching several hundred square feet of shrubbery, singing the building and causing a natural gas leak, officials said. The fire ignited just before 11:45 a.m. on Tuesday in the planters in front of the community center at 363 E. Villa Street, Pasadena police Lt. Pete Hettema said. “Some witnesses saw two people come up and throw a firework into the area,” the lieutenant said. They were described only as a Latino man and woman in their 30s. The woman was wearing a white dress. The fire spread through the shrub-filled planters in front of the community center and made its way up against the building, causing minor damage, Hettema said. The fire damaged a natural gas regular, sending the flammable gas seeping into the air. Firefighters made quick work of the fire and prevented serious damage to the structure, a city-owned facility used often for community events and programs, officials said. Several palm tree fires in the city on Tuesday were also suspected to be the result of illegal fireworks, Hettema said. Anyone with information can reach Pasadena police at 626-744-4241. PASADENA >> A man received two life prison terms, plus an additional 14 years behind bars, on Wednesday for a 2012 arson fire at a Pasadena boarding home that left two of his roommates dead, authorities said. Garth Allen Robbins, 54, will spend the rest of his life in state prison after receiving his sentence from Los Angeles Superior Court Judge Stan Blumenfeld at the court’s Pasadena branch, according to Los Angeles County District Attorney’s spokesman Greg Risling. 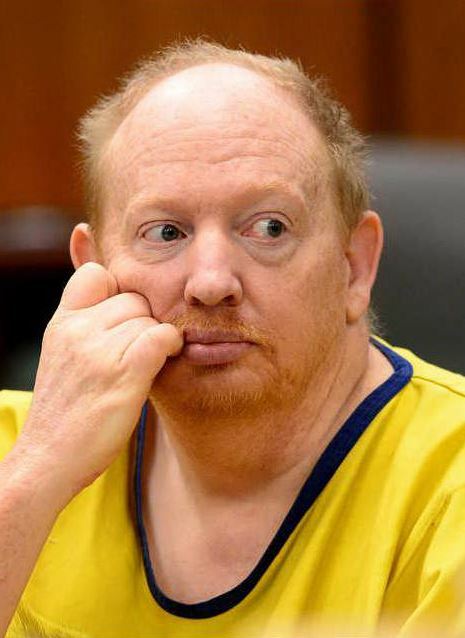 A Pasadena jury convicted him in April of two counts of first-degree murder, one count of arson causing great bodily injury and one count of arson of an inhabited structure for the Nov. 1, 2012, arson at the illegal boarding home at 1385 El Sereno Ave. The jury also found true the special allegations of multiple murder and murder during the commission of an arson. Robbins was staying at the boarding home along with 17 other residents, who were asleep inside when he lit the three-story house on fire during the early-morning hours. Residents Cliff Juan Clark, 56, and Paul Richard Boyd, 75, died in the fire, coroner’s officials said. Another 65-year-old resident of the boarding home suffered severe injuries, but survived. At Wednesday’s sentencing hearing, “Robbins was sentenced to two consecutive sentences of life without the possibility of parole, plus an additional 14 years,” Risling said. The motive in the deadly arson was never fully explained, officials said. Robbins stated during the trial process that, “he wanted his life to go away,” but there was no indication that he was angry with his roommates, Pasadena Fire Department spokeswoman Lisa Derderian said. The owner of the boarding home subsequently pleaded guilty to 23 Pasadena city ordinance violations. She was sentenced to three years of probation and ordered to pay $6,200 in fines. PASADENA >> A Pasadena man will spend the rest of his life in prison after a jury convicted him Friday of two counts of murder and other charges for torching a Pasadena boarding home in 2012, killing two men and leaving another severely burned. A Pasadena jury deliberated for less than an hour before declaring Garth Allen Robbins, who turned 54 on Wednesday, guilty of two counts of first-degree murder, one count of arson causing great bodily injury and one count of arson of an inhabited structure in connection with the deadly and intentional Nov. 1, 2012, fire at a three-story illegal boarding home where he was staying at 1385 El Sereno Ave., according to Los Angeles County District Attorney’s Office spokesman Greg Risling. The jury also found true the special allegations of multiple murders, as well as murder in the commission of the arson of an inhabited building, making him potentially eligible for the death penalty, he said. But the prosecution previously elected not to seek capital punishment in the case. Robbins is expected to be sentenced to two life terms in prison, without the possibility of parole, when he returned to the Pasadena branch of Los Angeles County Superior Court for sentencing on June 7. The motive in the deadly arson was never fully explained. But there was no indication his roommates were specifically targeted. Robbins stated during the trial process that he’d lit the fire because “he wanted his life to go away,” Pasadena Fire Department spokeswoman Lisa Derderian said. Robbins has been in custody since the day after the fire, more than four years ago. “After four days of dramatic testimony by victims, firefighters and police officers, the jury returned a verdict of guilty on all counts,” Eaton said. Prosecutors initially filed 15 additional counts of attempted murder against Robbins for the 15 other survivors of the arson attack, but those charges were dismissed by the court prior to trial, Risling said. Killed in the fire were Cliff Juan Clark and Paul Richard Boyd, who succumbed to smoke inhalation, coroner’s officials said. Another resident of the boarding home, then-65-year-old Perry Simmons, suffered sever injuries in the fire, but survived. The owner of the boarding home has since pleaded guilty to violating a 2007 city ordinance barring boarding homes and group homes of more than six residents in most parts of the city. Jeannette Broussard was initially charged with 136 municipal code violations, but ultimately agreed to plead guilty to 23 violations. She was received three years of probation, $6,200 in fines and penalties and victim restitution. Eaton commended the many police and fire investigators who handled the complex case. 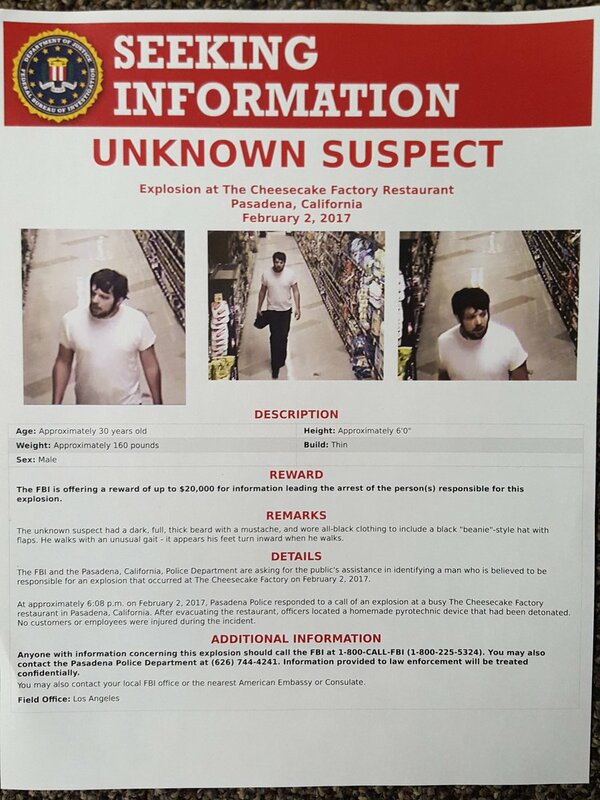 PASADENA >> Police and FBI officials released surveillance video on Friday depicting a man suspected off tossing a homemade explosive device into a crowded Pasadena Cheesecake Factory restaurant last month and offered a $20,000 reward for information in the case. No one was hurt during the bizarre incident, which took place just after 6 p.m. on Feb. 2 at the restaurant at 2 W. Colorado Blvd. But the unexplained attack left nerves on edge, and investigators continue seeking the man responsible. The FBI offered a $20,000 reward for information leading the arrest of the person or people responsible for the incident, said Deidre Fike, assistant director of the FBI’s Los Angeles field office. Investigators have been gathering clues, interviewing witnesses and following leads since Feb. 2, but the case remains unsolved. “As we have exhausted those leads, the FBI is offering a reward up to $20,000 for any information that leads to tips and information that identifies the individual or group involved in this act,” Fike said. To that end, authorities released surveillance camera video footage from a Ralph’s grocery store at 320 W. Colorado Blvd., where Pasadena Police Chief Phillip Sanchez said the suspect went immediately after the “homemade pyrotechnic device” was tossed into the restaurant. 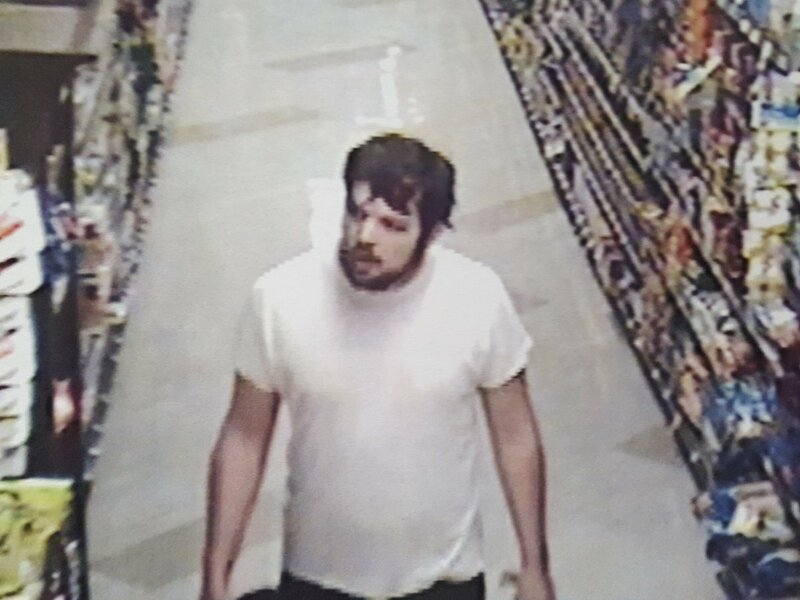 The footage shows a bearded man with a pigeon-toed gate walking through the store. The video, “captured images of the suspect wearing a white T-shirt and carrying dark clothing, originally worn at the time of the incident,” Sanchez said. The suspect is later seen discarding the black item of clothing in a trash can. The garment was not recovered, Sanchez said. Police have described the suspect as a possibly Latino or Middle Eastern man of about 6 feet tall, with a heavy beard, wearing all-black clothing. Sanchez said investigators had conducted surveillance on another man who turned out not to be involved. Officials declined to describe the recovered explosive device in detail. It was unclear whether it had detonated to its full potential, or malfunctioned. The device caused only minor damage inside the restaurant. Mayor Terry Tornek previously said the device was more akin to a firecracker than a bomb. And the intent of the man who lobbed the device also remains unknown. Between the reward and the clear video footage, Fike said investigators were optimistic that new information will come to light. “We believe that once this video is released, it will lead to tips coming in that will support the investigation, she said. “Until we really identify who the individual is, determine the motive for this action and have an opportunity to interview him and any associates, we really don’t know,’ Fike said. “We have no reason right now, we have no evidence to believe it was a terrorist attack. But again, we do not know the motive, and that’s why we’re reaching out to the community,” she said. Anyone with information is urged to contact the FBI’s Los Angeles tip line at 800-225-5324. Tipsters can remain anonymous, Fike said. AZUSA >> An Azusa man is accused of arson for intentionally lighting fire to a field of grass on the campus of Azusa Pacific University on Saturday afternoon, authorities said. Jesus Moreno, 31, was booked on suspicion of arson in connection with the fire, which was first reported about 3 p.m. on a grass median in the parking lot of college’s west campus, 701 E. Foothill Blvd., Azusa police Sgt. Andy Sutcliffe said. Upon receiving reports of the fire, officials encountered a 60-foot by 60-foot area of grass on fire, he said. Los Angeles County firefighters made quick work of the flames. Police were investigating the scene when they noticed Moreno walking nearby, Sutcliffe said. “What caught their attention was the fact the entire right side of the baggy, button-up shirt he wore had clearly been burned,” according to the sergeant. Moreno himself was uninjured. “Once detained, Moreno told officers he did not have a place to stay, and intentionally lit the fire to get the attention of police officers,” he said. He provided no further explanation for his actions. Moreno succeeded at both. He was being held in lieu of $50,000 bail at the Azusa Police Department’s jail pending his initial court appearance. PASADENA >> No one was hurt when a man threw some type of “homemade pyrotechnic device” into a Cheesecake Factory restaurant in Old Pasadena on Thursday evening, authorities said. The attacker remained at large following the incident, which took place just after 6 p.m. at the restaurant at 2 W. Colorado Blvd., Pasadena police Lt. Art Chute said. The restaurant was crowded with diners when a man opened the front doors and tossed in the device, which exploded, the lieutenant said. No injuries or significant damage to the building were reported. The device was described as a seemingly homemade pyrotechnic device containing gunpowder, Chute said. The man who threw the device was last seen fleeing the area on foot. The motive in the bizarre attack remained a mystery. “Pasadena police detectives are currently handling the investigation and out of an abundance of caution, the federal authorities have been notified,” according to the statement. Police described the man as a Latino or Middle Eastern man, about 6 feet tall, of thin build, with a heavy beard. He wore all black clothing and a black beanie. PASADENA >> Police and fire officials arrested the second of two suspects Thursday connected to the torching of a car in Pasadena six months ago, authorities said. Police found and arrested Artesha Daniels, 39, of Pasadena in Los Angeles on Thursday morning, according to Pasadena police Lt. Jesse Carrillo and Los Angeles County booking records. Fellow suspect Alejandra Martinez, 25, of Pasdena turned herself into authorities Tuesday, records show. The suspects’ identities had been known to investigators since the days following the March 19 arson fire at La Tierra Street and Daisy Avenue, Pasadena Fire Department spokeswoman Lisa Derderian said. “(Fire investigators) had been actively searching for the suspects with the police department,” she said. An arrest warrant was issued months ago, but the two suspects eluded authorities until this week. The alleged arson, which destroyed the victim’s 2002 Volvo as it was parked on the street, was believed to have been motivated by personal dispute between the suspects and victim, Derderian said. Further details regarding the motive were not available. Investigators found the Volvo had been doused with flammable liquid and set ablaze, she said.